Unroll this classically packed maki to find a uniquely patterned pair of one-size-fits-all socks. Get ready to look good enough to eat. 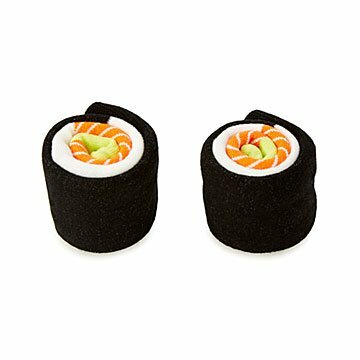 Wear your love for Japanese cuisine with these soft cotton socks. Packed and rolled to resemble the traditional maki treat, they'll stand out in your sock drawer. Unrolled, they reveal an artful, color-blocked pattern that'll stand out in your 9 a.m. meeting. Don't keep this sushi secret to yourself, though—they also make a perfect stocking stuffer. Made in China. I got these socks for my boyfriend. They're so cute. They're not very thick, but he liked them. Would definitely get more in different designs. I am giving these socks to my granddaughters along with a pair of chopsticks. I think they will really get a kick out of wearing them! So adorable! Can't wait to see them opened. Sure to cause some giggles and good cheer. Always on the Hunt for Fabulousness! Looks awesome, feels awesome, and I'm tempted to buy the other Maki Socks! It is cool that when they are rolled up they look like pieces of sushi but when they are being worn the design is still somewhat casual.